The CAGC is proud of it’s continued commitment to Canadian Genetic Counsellor Certification. Canadian Certification is a valued standard of competence. As part of efforts to promote Canadian Certification to employers, government agencies and the general public the following Canadian Certified Genetic Counsellor (CCGC) value statement was created. The Canadian Association of Genetic Counsellors (CAGC) Certification Board Committee is committed to ensuring that members of the Canadian public are receiving genetic counselling services from health care professionals with a standard level of knowledge, skills, attitudes, and judgement. 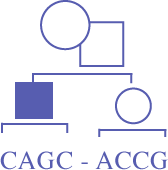 Genetic counsellors granted the credential CCGC (Canadian Certified Genetic Counsellor) and/or its French equivalent CGAC (Conseiller(ère) en génétique agréé(e) du Canada), have demonstrated these standard knowledge and practice competencies. The genetic counselling profession is currently unregulated in Canada. As such, practitioners are not governed by provincial and territorial legislation ensuring safe, competent and ethical practice in the interest of public protection. National certification demonstrates competence of the genetic counsellor and a high level of commitment to the practice of genetic counselling in Canada. The national certification credential is an important basis for evolution of professional legislation and regulation in Canada.